Well I didn’t before, but now that it’s on Switch . . .
It’s been a long time since I was able to sink dozens of hours into one of NIS America’s deep and silly tactical role-playing games. But now that Disgaea 5 Complete is on the Nintendo Switch, I never have to put it down. That’s wonderful. Also dangerous. For those of you unfamiliar with Disgaea, it’s a series of tactical role-playing games created by Japanese developer Nippon Ichi Software. The series began in 2003 with Disgaea: Hour of Darkness for the PlayStation 2. Since then five sequels have been released: Disgaea 2 through 5 and D2: A Brighter Darkness, a direct sequel to the original. While Disgaea games are generally set in some variation of demonic Netherworld, the series is know for its silly sense of humor. It’s a kinder, gentler sort of evil we’re dealing with, more likely to engage in slapstick humor than run about devouring souls. It also bears noting that, with the exception of D2: A Brighter Darkness, each Disgaea game is its own self-contained affair. Characters from previous games will make cameo appearances or be referenced, but you don’t need to have played any of the others to enjoy the latest. The other defining characteristic of the Disgaea series is depth and length. Beneath each game’s cutesy anime trappings lies a complex tactical role-playing game. When not involved in engaging turn-based battles, players are creating and leveling characters, purchasing and upgrading equipment, fighting political battles with a demonic council to earn buff and bonuses—there’s a ridiculous amount of management and stat juggling involved. If you’re into that sort of thing, it’s just perfect. 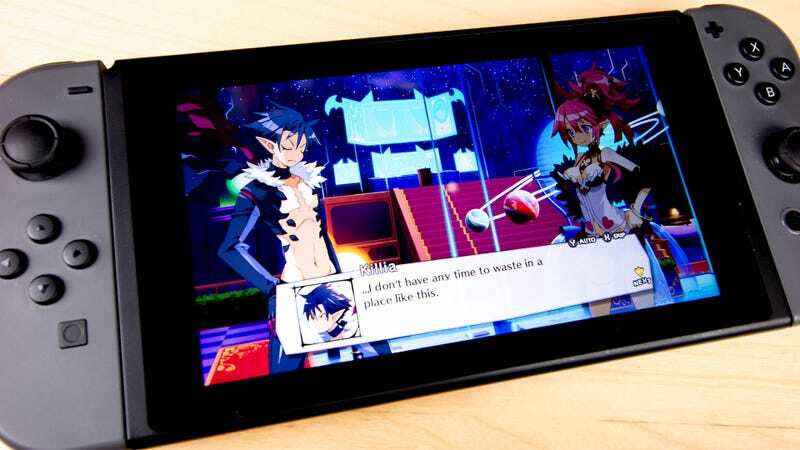 While the casual player can blow through a game like Disgaea 5 in a mere 40 or so hours, there’s easily more than a hundred hours of game here for the more dedicated tactical strategy buff. That’s a whole lot of time to sit in front of a video game console—certainly more time than I have. That’s why Disgaea 5 Complete for the Nintendo Switch is so dangerous. You can pick it up and take it with you. You can also pick up your teammates and throw them across maps, but it’s not the same thing. While there have been handheld ports of Disgaea games in the past, the DS and Vita didn’t have the proper screen real estate to make them really sing. The Switch’s 6.2 inch screen is perfect here, as well as clear enough that getting up close doesn’t involve much in the way of eye strain. Here’s an overview trailer that might help put the game’s beautiful complexity into perspective. So what’s Disgaea 5 about? The story revolves around a group of characters travelling the Netherworld on a quest for revenge against the evil Void Dark. The redhead in the lingerie is Seraphina, the Overlord of Gorgeous Underworld who believes all men should serve at her feet. The chesty dark-haired guy is Killia, a young demon and certified badass. In the yellow outfit riding a giant undead penguin beast is Usalia, a character cursed to only eat curry lest she turn into a beast. This is all stuff I love but haven’t had the time to really invest myself in for years. Since downloading the game for the Switch last week, I’ve played Disgaea 5 Complete in bars, at the bus stop waiting for my kids to get home, in bed, in the bath and beyond. It’s wonderful to be able to play the game properly whenever and wherever I want. Sure, it’s completing killing any free time I had left, but it’s a hell of a way to go.